We know, we know. We were surprised, too, when we learned that Leslie’s wall of inspirationally powerful women—including Madeleine Albright, Condoleezza Rice, and Nancy Pelosi—could just as easily have been a shrine to a sickle-and-chain-wielding Mother Russia, striding atop the remains of the Statue of Liberty and holding hands with her boyfriend, Stalin. 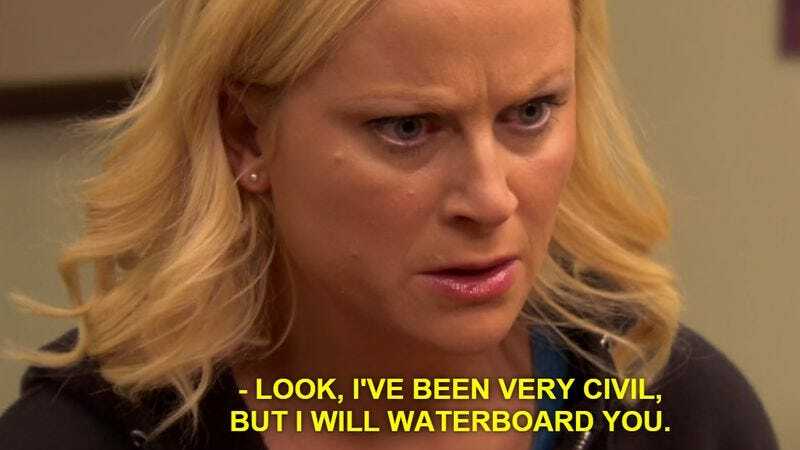 After all, outside of her religious zealotry for waffles and a distaste for libraries that the uncharitable might characterize as “Pol Pot-esque”, it’s hard to see much fascism in a democracy junkie like Ms. Knope. But that’s the danger of fascism, always lurking behind the eyes of the sitcom character you least suspect. As right-minded Americans, wary of the disease’s creeping, laugh track-backed tendrils, we can only anxiously await Harsanyi’s next essay, in which he lays out the totalitarian underpinnings of the New Girl cast, or reveals the Modern Family crew as a secret squad of jackboot-wearing stormtroopers, lurking in the heart of middle America like a big, pulsing, Ty Burrell-faced tumor. Keep watching the skies, America. Don’t turn your back on the cast of Friends, and for the love of God, keep watching the skies.